Lisa’s Biography – Devlin Law Firm P.C. Lisa is a sought-after speaker and trainer. She has spoken at events sponsored by Meetings Professional International, Professional Convention Management Association, Exhibitor Show, Hotel Sales and Marketing Association International, Society of Government Meeting Planners, Conference Direct, Experient, Collinson Media (now Connect Meetings), Elite Meetings Alliance, and many others, and served as adjunct faculty for Arizona State University’s Professional Meeting Manager’s Partnership program. 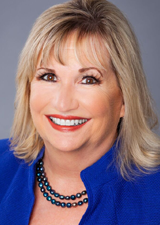 PCMA named her one of its “Best in Class” speakers for 2012. Lisa attended the University of Iowa where she received her B.S. in 1981 in Anthropology and Journalism with High Distinction, Phi Beta Kappa; and her Juris Doctor in 1984, also with High Distinction, and Order of the Coif.